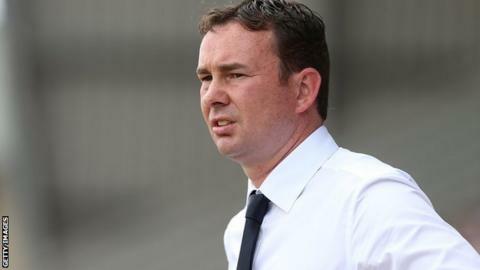 Plymouth Argyle let themselves down defensively in their 5-3 loss to Millwall in the Football League Trophy, according to manager Derek Adams. Lee Gregory scored a hat-trick for the Lions as Plymouth went out of a second cup competition in four days following their 2-0 FA Cup loss to Carlisle. "Defensively we've let ourselves down," Adams told BBC Radio Devon. "We can't defend the way we defended for the five goals. The five goals given away, they were all preventable." But Adams says he was pleased with other aspects of how his League Two leaders fared against League One's seventh-placed side. "The performance was 100-times better from the performance on Saturday," Adams said after the heaviest loss in his Plymouth Argyle reign. "I thought it was a very good performance, we passed the ball and kept it and showed a willingness to stay in the game. "Millwall are a very good side and a league ahead of us and doing well at the top, and their two strikers in [Lee] Gregory and [Steve] Morison caused us problems. "We'll score goals, there is no problem about that, you've seen that against League One opposition that we can create chances, we just have to keep it tight at the back."